Did you check under ALL the snow for dandelions? Well, check again. Toshi is a hard taskmaster/mistress to please! "No, hoomin. You don't have time to waste putting on boots or a coat! Get out there and start diggin' for my dandelions! Now! *THUMP! * "
Oh boy! We've gotta get moving. Hey, like, er, if we dig really really fast in the snow, maybe we'll keep warm. Maybe. What's that? Don't comeback indoors until we have found dandelions? Oh no! 8 feet of snow, an Alberta clipper in process, 45 mph winds, 5 degrees below zero with a wind chill of 31 below zero and Toshi wants Amy to do what???? I wonder of that old Rod Stewart song "Mandolin Wind" applies to Amy and Stuart? Hi, everyone! 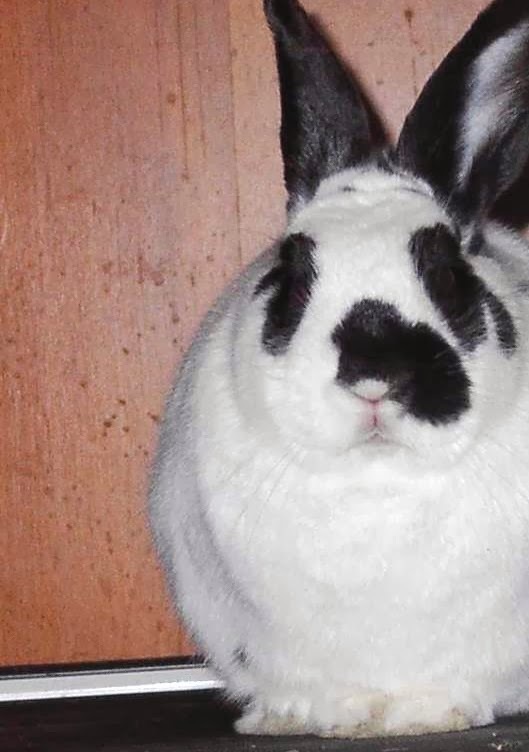 I know we have an international bunch here and wanted to let you know, via Champis, that's there's a bun in Sweden in need of a new home. Google Translate (Swedish) will help you out, or you can post a comment and Paula will respond in English. Stampe is a Teddy, and what a looker! Speaking of lookers, Toshi! I'd dig for dandelions for you any day! K.
Oh, yeah, RG, Toshi is nothing if not understanding. I feel as though I owe it to you to mention that Stuart is also very understanding.